Weighty Matters: Does CSPI's Real Bears Video Promote Anti-Fat Bias? Does CSPI's Real Bears Video Promote Anti-Fat Bias? That was the question posed to me by 3 keen young RDs who attended my last Friday's trenchtalk in Toronto. Funny thing is, I knew exactly where they were coming from. The first time I watched CSPI's Real Bears video I too scratched my head and pondered whether or not the message was fair. 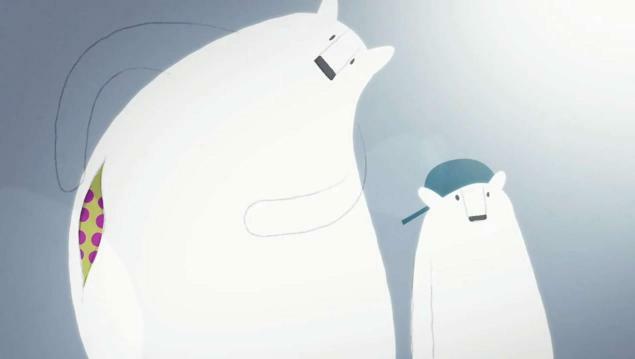 In the video (which if you haven't seen it is embedded below) a family of polar bears is depicted drinking "happiness" by means of a caramel coloured sugared soda that looks like Coca-Cola and in turn suffering some health consequences. Papa bear gets it the worst. He gains weight, splits his pants, develops diabetes, endures bleeding gums and tooth decay, suffers erectile dysfunction, and requires a leg amputation. Baby bear also suffers a touch as he finds himself too large to hunt a delicious and tasty fish. So indeed, CSPI's video portrays an association between the consumption of sugared soda and obesity (and diabetes), but I don't think it promotes anti-fat stereotypes. The fact is drinking sugar sweetened beverages does increase your risk of developing obesity and/or type 2 diabetes and what CSPI does not do is stoop to stereotype to add flavour to the bears. The bears aren't portrayed as lazy. They're not portrayed as gluttonous. They're not portrayed as stupid. They've just found themselves caught up in the current of junk food marketing and have made sugar-sweetened beverages a regular part of their lives. CSPI targets a behaviour - drinking sugar-sweetened beverages - as unhealthy. And guess what? They're right.